This is not a car for someone in the Witness Protection Program. 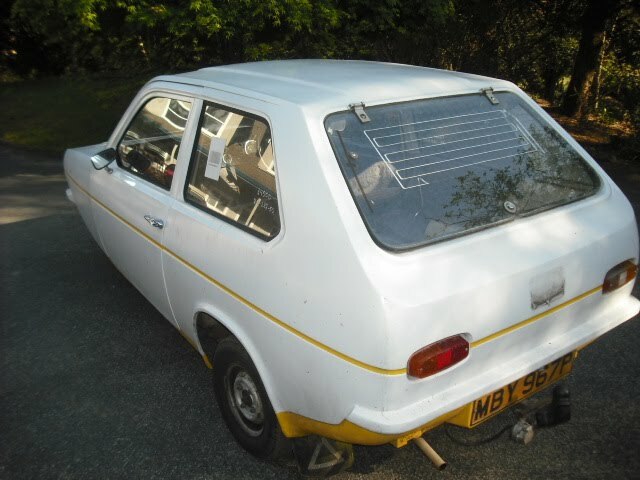 I can't think of another car that would draw as much attention as a Reliant Robin. (OK, maybe a Reliant Regal.) Even the 3-wheel Bond looks less bizarre than this. This is not your ordinary Reliant Robin (as if there is such a thing). This is a Reliant Super Robin. It has an 850cc engine (as opposed to 750 in the standard Robin) that actually moves this very light, fiberglass, car at a reasonable pace. 60 MPH comes in 16.1 seconds. There were plenty of cars from plenty of big name manufacturers that couldn't beat that number in 1976. The Reliant's handling is, as you can imagine, interesting. This Super Robin is in the US. The seller says it runs well, but needs some cosmetic work. Not the most practical car for everyday use (unless you look at it as a somewhat slow, weatherproof, alternative to a motorcycle), this car would be a huge hit at any car show. In his ad, the seller includes a link to a Photobucket page that has 20+ pictures and a few videos. You can find it here. Located in Aptos, CA, click here to see the Craigslist ad. A big thanks to JaCG reader, Anthony, for sending me the link to this car! 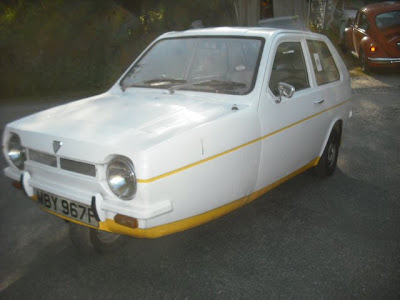 Seeing a Reliant Robin makes me think of the Top Gear segment on the car that makes me laugh just thinking about it. Myke, you beat me to it! I thought exactly the same thing. 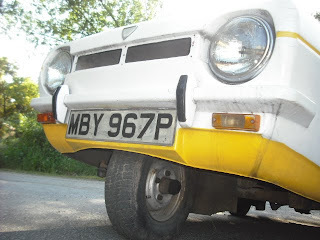 For another fun video, try looking up "Top Gear Live - Reliant Robin Race" on YouTube. It's a rollover fiesta. "This is not your ordinary Reliant Robin (as if there is such a thing). This is a Reliant Super Robin." This certainly is a golden quote if there ever was one. Reliant should have put some sort of oversized Trans-Am type decal on the hood of this vehicle so streetracer types would be put on notice that they risked mixing it up with the more powerful Super Robin. The intimidation factor at the "stoplight staredown" would increase significantly.